Frederick C. Wilkowski, for many years a well known figure in this community and one of Watertown's best known citizens, died at his home, 822 Main Street, this morning at 9 o'clock. Mr. Wilkowski had been in ill health for the past year suffering from septic bronchitis but his death was due to a sudden heart attack which he suffered while sitting in a chair at his home shortly after he had partaken of his breakfast. Mr. Wilkowski passed away possessed of his complete mental faculties and only a short time before the end he had been shaved by a barber and had finished breakfast. Mr. Wilkowski was born in Bromberg, province of Posen, on January 4, 1862 and came here with his parents in 1855 and had since been a resident of this city. In 1876, on May 12, he was married to Minnie Schroeder of this city who with four children survive. The children are Mrs. Rose Torstensson of Landskorna, Sweden, Carl Wilkowski, this city, Mrs. Emma Haes, Metropolis, Ill., and Mrs. Gertrude Renk, Waterloo, Iowa. Besides, one sister, Otillie Buending of this city and one brother, William Wilkowski, San Diego, Cal., survive, as do six grandchildren and Mr. Wilkowski's stepfather, Fred Kuehl. 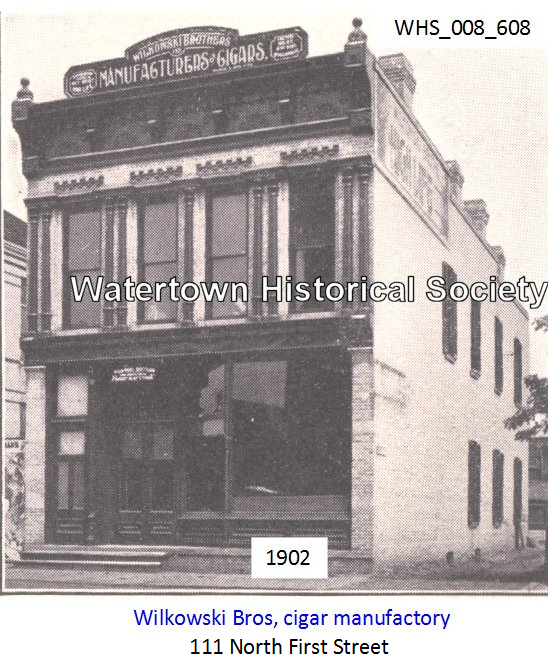 Mr. Wilkowski rose to a successful business career by his own efforts, and during his long business career had helped materially in the industrial growth of Watertown. A man of strict probity, fine character and withal possessed of a genial disposition, he made many friends, socially and among his business associates. By strict attention to business affairs he built up a large trade throughout this section of the country, a tribute to the excellence and honesty of the products of his factory. 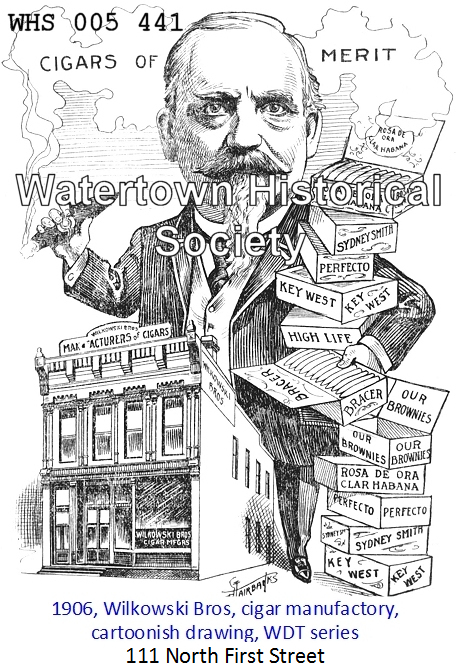 Coming to Watertown when city was but little more than a village, he spent the greater share of his life here and was probably one of the best known and most respected of its citizens. The firm of Wilkowski Bros was established in 1882 by Frederick and William Wilkowski. Ten years later he succeeded to entire control and personally superintended the operations of the plant. Two years ago he retired from active business and his son, Carl Wilkowski, succeeded him as head of the firm. When ten years of age Mr. Wilkowski began an apprenticeship in a cigar factory and learned the details of the business thoroughly, being considered one of the best judges of tobacco in this section of the country. Mr. Wilkowski was an ardent student of nature and was well posted on plant life of which he made a study for many years. He was a man well versed on current topics and a student who had the faculty of retaining the knowledge thus obtained. He was a man greatly devoted to his home and family. Possessed of a kindly nature he spread geniality wherever he went and his charities were many but never ostentatious. His nature was of the kind that make and keep friends and the good will of the man was always apparent whether in business dealings or in his social life. Mr. Wilkowski never aspired to a public or political life although he was well capable to enter such fields and he was often urged to do so. He was a member of the Plattdeutscher Verein. The funeral will take place Tuesday afternoon from the home at 2 o'clock and burial will be in the family lot at Oak Hill cemetery. The funeral services will be private. Carl L. Wilkowski, former Watertown business man and well known in the community, died at St. Mary's hospital Saturday at 2:15 p.m. following an illness. 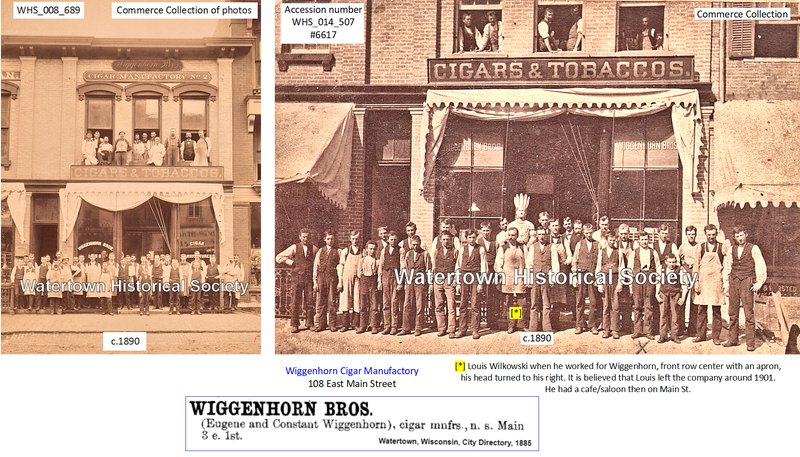 He was born in Watertown, a son of the late Mr. and Mrs. Fred C. Wilkowski and was for many years associated as a salesman with the firm of Wilkowski Bros. cigar factory here. In 1917 he took over the business as his own and operated it until it was closed. For the past several years he was employed by the G. B. Lewis Co. here. Mr. Wilkowski was a lifelong resident of Watertown. The firm Wilkowski Bros. was one of the most widely known cigar manufacturing concerns in this territory. It was established in 1882 by two brothers, Frederick and William Wilkowski and ten years later Fred G. Wilkowski succeeded to entire control of the business. In 1917 his son, Carl L., took it over. 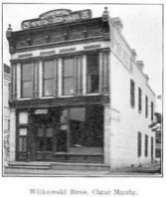 The business was located in the building at 111 North First Street. Surviving Mr. Wilkowski are his wife, the former Emma Nowack, and one daughter, Miss Ruth Wilkowski, this city, a member of the Watertown Free Public library staff. There are also three sisters, Mrs. Hans Torstensson, Milwaukee, Mrs. Joseph Hayes, Toulon, Ill., and Mrs. George Jones, Conrad, Ia. The funeral will take place Tuesday afternoon at 2 o’clock from the Nowack funeral home. The Rev. Dr. J. Perry Austin of St. Paul’s Episcopal Church will officiate. Interment will be in the family lot in Oak Hill Cemetery. John C. Gruel was a salesman for Wilkowski Bros. cigar manufacturers for several years.